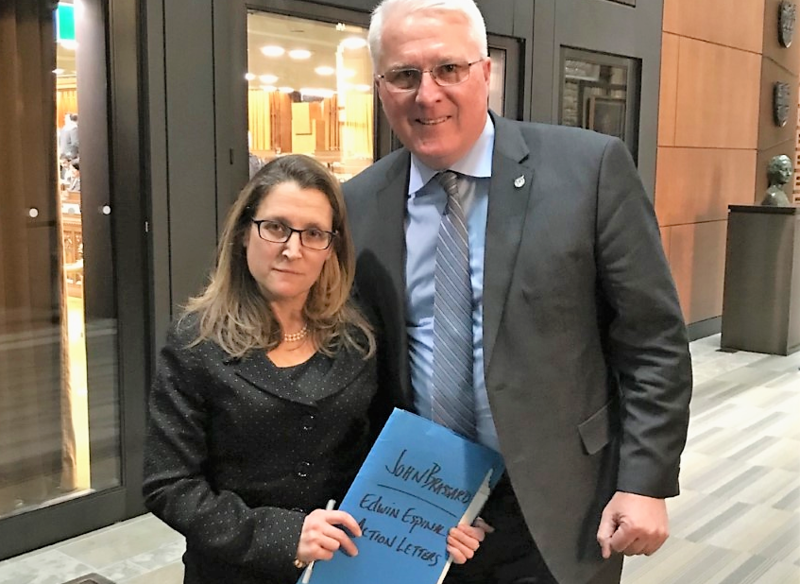 Foreign Affairs Minister Chrystia Freeland receives letters written by Innisdale Collegiate students in support of Edwin Espinal from Barrie-Innisfil MP John Brassard. Canadian Minister of Foreign Affairs Chrystia Freeland has responded misleadingly, and even deceptively – in the assessment of the Simcoe County Honduras Rights Monitor, Rights Action and Honduras Solidarity Network – to a Parliamentary e-petition on the human rights situation in Honduras, the illegal detention of political prisoner Edwin Espinal, and Canada’s role in the on-going human rights crisis. The petition was initiated October 10, 2018, by Janet Spring, mother-in-law of Edwin Espinal who has been illegally detained as a political prisoner in a maximum-security military-run jail since January 19, 2018. Edwin is married to Janet’s daughter Karen Spring, a human rights expert and activist living in Honduras since the 2009 military coup ousted Honduras’ last democratically elected government. Canada’s “engagement” in Honduras can only be assessed by actual policies and actions since the 2009 military coup, not by the repetition of pro-human rights statements littered throughout the Minister’s response to the petition. The merits of these two “aid” programs are debatable in terms of whether these are the most effective ways to promote human rights and the rule of law in Honduras. The MACCIH has had very limited success at holding high-level government officials accountable for corruption and the pillage of tens of millions of dollars from public institutions. Over 30 Honduran Members of Congress have been indicted on corruption charges, and none has seen the inside of a jail cell. Compare that to political prisoners Edwin Espinal and Raul Alvarez, who have spent 15 months inside a maximum-security military prison on trumped-up charges related to protesting the 2017 fraudulently stolen elections and government killings and repression! Furthermore, despite MACCIH’s criminal indictments against dozens of Honduran officials, Canadian officials continue to do business with family members of these indicted officials. 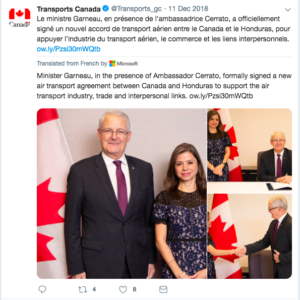 Why do Canadian authorities do business and pose for photos ops with the Honduran political and economic elites deeply embedded in corruption? -Promoted the continuing expansion of Canadian business and investor interests in mining, sweatshops, tourism, and “clean” energy projects. -More Hondurans are forced to flee their homes and countries in ‘caravans’ or individually, year after year, than at any time since the early 1980s. “Canada also advocates for democracy in Honduras. Canada helped fund the Organization of American States’ Electoral Observation Mission in Honduras during the last Presidential election in November 2017, and supports the mission’s findings and recommendations. This statement borders on being false. The OAS’s electoral observation mission in 2017 wrote in their preliminary report: “the abundance of irregularities and deficiencies is such as to preclude full certainty regarding the outcome.” Despite the OAS recognizing wide-spread deficiencies and calling for new elections, and despite the fact that Juan Orlando Hernandez ran illegally for re-election, the Canadian government recognized the electoral results on December 22, 2017. Canada –along with the U.S.– are the only two governments in the world to recognize as “legitimate” the three sets (2009, 2013, 2017) of fraudulent, violent and undemocratic elections that have served to keep in power repressive, corrupt governments since the 2009 coup. In our view, it is insulting to the Honduran people that Canada –along with the U.S.– called for ‘dialogue’ after Canada and the U.S. openly supported the President and government that had fraudulently and violently stolen the elections! Furthermore, the National Dialogue process that did start in August 2018 and ended in December 2018, failed completely. No agreements or consensus were reached on several issues during the so-called “dialogue” and none of the major points discussed have been acknowledged or approved by the Honduran Congress. One of the major points of conflict during the dialogue process was an amnesty for all political prisoners -including Edwin Espinal- that was agreed upon by all parties, except the Honduran government. Here again, Canada’s calls for “inclusive dialogue” ring hollow, given that Canada openly recognized the president and political party that corrupted the electoral process and fraudulently and violently stole the elections, and then continued to use military and police repression, across the country, against the Honduran people –including Edwin Espinal– who were protesting the stolen elections. At this point, Freeland’s response is simply piling more pro-human rights statements on top of previous ones. In the case of Edwin Espinal, his entire legal process – from the initial illegal detention, based on trumped up charges, to now 15 months of illegal detention in abusive conditions in a max-security military jail – has been characterized by constant violations of due process. Endlessly repeating calls to respect the rule of law ignores the fact that the Honduran government is, in Edwin’s case and in the case of many others, using the legal and penitentiary systems as tools of repression. Minister Freeland’s final statement – related to the illegal detention of Janet Spring’s son-in-law Edwin Espinal (held as a political prisoner in a maximum-security military jail since January 19, 2018, on trumped up charges related to protesting the stolen elections) – is also false. One need only consider political, military and/or economic measures the Canadian government has taken (invariably together with the U.S., Britain and a number of G7 club members) against other governments that Canada opposes or has differences with. The only difference in this situation is that Canada recognizes Honduras as a “democratic ally” and chooses to maintain full diplomatic, aid, economic and “security” (police and military) relations with the regime. If Canadian officials met with the above offices, as stated – When did they meet with them? Who did they meet with? What demands did Canada make? What commitments did they secure from them? Have they followed up and continued to push for the release of Edwin, and all political prisoners, and the dropping of all the trumped up charges? Given that absolutely nothing has changed for Edwin Espinal and other political prisoners in Honduras, we highly doubt Canada has made human rights and Edwin Espinal’s case a priority in their engagement with Honduras. We call on Prime Minister Trudeau and Minister Freeland to meet with the Spring family, and a few supporters, to discuss the urgent matter of the on-going and abusive detention of their family member, Edwin Espinal. Please write to Prime Minister Trudeau and Minister Freeland, with copies to your MP and the MPs listed below, urging them to support this face-to-face meeting with the Spring family. Soon to be launched: a House of Commons paper petition sponsored by MP Elizabeth May. It is very sad that Canada does not seem to have respect or compassion for its own. Honduras continues its corrupt ways and our Foreign Affairs department seems to condone such behaviour. It leaves one wondering if this kind of mind set exists right here at home. We see Canadian companies actively inflicting wrongs on the citizens of this country and turning a blind eye. It is sad to think that in some way our Government by its inaction to do something for these political prisoners, is complicit. .?? ?